This post is a paid feature placed for John Lewis. Get your children excited about planning and preparing a meal by choosing a theme for your project. Colour themes work especially well for this idea, so have your kids brainstorm a list of foods that work with the theme and take them on a scavenger-like shopping hunt to find the right ingredients. Make sure to select a dish from each food group and use child-friendly recipes so that the prep, cooking, and clean-up isn’t too complicated for the little ones. 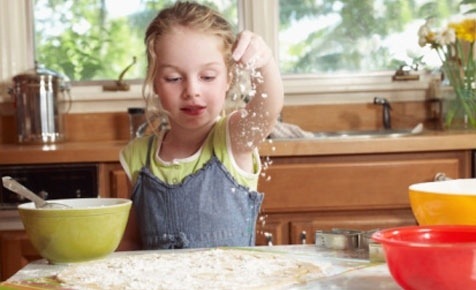 Cooking can be a really fun activity for kids, as it allows them to learn in a hands-on way. Make them feel a part of the process by assigning age appropriate tasks to them in the kitchen. Preschool aged children might enjoy washing fruits and vegetables, tearing lettuce for salad, or helping to roll out dough or pastry, while children in primary school may be able to tackle more challenging tasks, like measuring liquid and dry ingredients or mixing up ingredients in a bowl. Try to relax and let them make a bit of a mess in the prep stages; there will be plenty of time to teach them about clean-up later on. 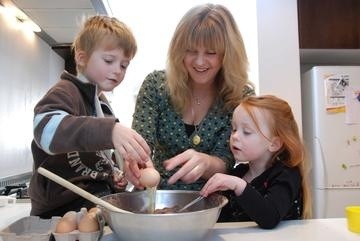 Children today love playing with gadgets, so why not incorporate them in a fun way while you’re in the kitchen together? Instead of following a recipe from a book, keep the children engaged by pulling up a cooking video made by kids for kids on YouTube; the verbal and visual instruction provided in these videos may be more suitable for young learners. Let them listen to Classic FM on DAB-radio to help liven up the cooking environment, and document their progress each step of the way by snapping photos with your handheld camera or Smartphone to stick on the fridge later on. Your kids will be much more likely to eat a meal if they’ve help to choose it and prepare it, but it never hurts to give picky eaters an extra push. The key here is to teach the kids that eating healthy is fun and tasty. Especially for the little ones, arranging food on the plate in a fun and creative way can be a big help: make broccoli trees with carrot stick trunks, rice snowmen with eyes and buttons made from peas, or a smiley face out of spaghetti (the mouth) and meatballs (the eyes). Once they’ve finished the main plates, reward them with a bit of dessert, preferably one with fresh fruits and just a little bit of whip cream or ice cream so that they don’t get hooked on treats that are too sugary. This entry was posted in Making & Baking, Parenting & Family, Reviews & Recommendations, Sponsored Posts and tagged broccoli, Classic FM, cooking, DAB radio, family activities, fast food, healthy eating, junk food, kids, music by Mayfair Mum. Bookmark the permalink.